Female jaguars are real girl bosses: they have to care for and protect their cubs, and do all of the hunting, all on their own! Atiaia, (ah-tee-eye-ah) meaning “the one who brings light,” is one of the few remaining jaguars in the Iguacu National Park in Brasil, and one of the favourite animals of our players, judging by the dozens of photos made with her in the app. The Iguaçu Carnivores Project, supported by Pró-Carnívoros and WWF-Brazil, closely monitors jaguars like Atiaia in order to safeguard the health of the entire Iguaçu ecosystem. This is how we come to know quite a bit about Atiaia's life. Atiaia is a very calm jaguar, good mother and very careful with her cubs. Jaguars stay with their cubs approximately until they are 2 years old, teaching them to hunt and survive alone. Atiaia is not frightened by the tourists, who are quite delighted when they can see her. 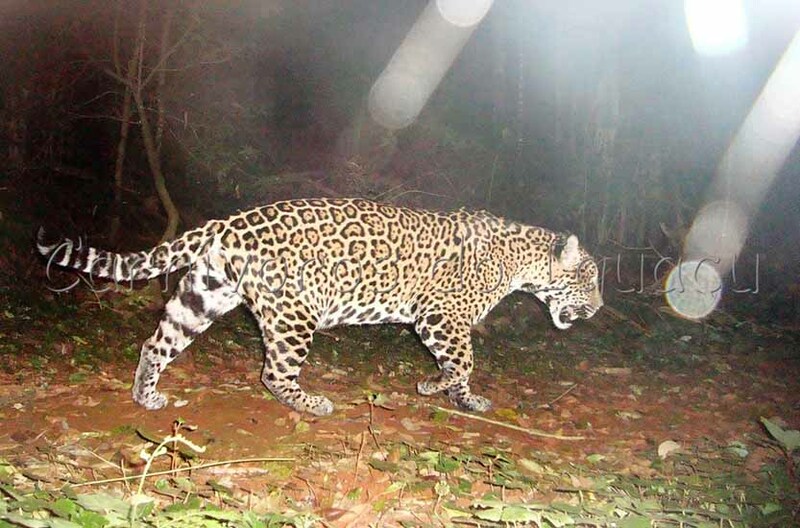 Atiaia is quite the local star, drawing public attention to the magnificence of her species via camera trap images, which scientists use to understand her behaviour. Recent sightings show Atiaia with a new cub, providing hope for all who are following her story. Above is a video captured by a camera trap of Atiaia in September of 2015. Footage and data of wildlife is usually reserved only for researchers and science, but WWF and Pro-Carnivores are sharing Atiaia's story for people around the world to get a better insight into her life and understand why jaguars like Atiaia need our protection. Creating an Augmented Reality version of Atiaia for Safari Central was quite a challenge: the spot pattern and walk have to be just right. We bring Atiaia to a global audience through games because we believe they are key to creating connections between people and animals, and to get more people involved in conservation. Users of our app seem to have a soft spot for this fierce lady. Of all the animals featured in the app, Atiaia is used most often. Do you want to take a photo with her? Download our app through the Apple App Store or Google Play. The jaguar is the largest cat and the top terrestrial predator in central and South America. Its diet consists of deer, peccaries and other small vertebrates. Another image from Atiaia, while she is on the prowl at night. Do you want to play around with Atiaia yourself? Download Safari Central from the App Store or Google Play!